Today's #31dc2017 post could have been obnoxious and sparkly, but I'm currently enjoying the transition into fall so I thought I would take a more modest approach. 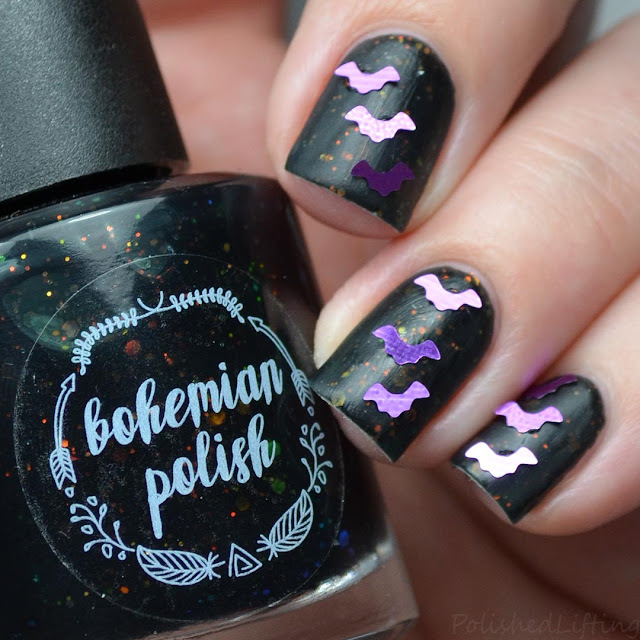 For this look I used Bohemian Polish Pulaski At Night as my base. I topped it off with a matte top coat, and then added cute bat glitter from KBShimmer. It's simple, but enough to let the world know how excited I am for the changing seasons. If you enjoyed this post you might like 31dc2017 - Delicate Damask feat. Bohemian Polish Comin' Home Again and Great Lakes Lacquer Polish Con Chicago 2017 LE.